This post is part of our Millennial Impact spring series "Getting Fresh." These blogs highlight our young, innovative contributors who have new ideas to solve old challenges. Check out more here. Who are the "diaspora"? The International diaspora Engagement Alliance (IdEA) describes them as "a community of people who live outside their shared country of origin or ancestry, but maintain active connections with it. A diaspora includes both emigrants and their descendants." According to the World Bank, the official global diaspora remittances reached a record $500 billion in 2012. Sri Lanka, my home country, accounted for $5 billion of it sent by nearly 2 million Sri Lankans living abroad. For sending remittances equivalent to 8 percent of the country's GDP, the Sri Lankan diaspora merit more than just a pat on the back. They deserve some serious attention from a wide spectrum of stakeholders, from the international community to local policy makers. My role as a member of the Sri Lankan diaspora over the past ten plus years has been dictated by a mixture of compassion, gratitude, and relatively better-off wealth: traits of an effective philanthropist. My initial role as a diaspora philanthropist was during the 2004 South Asian tsunami. As a 23-year-old who was determined to help the survivors, I led a campaign to raise a $20,000 fund to build houses for the victims in my mother-country. Based on this fulfilling experience of giving-back, I got together with a similar-minded group of fellow Sri Lankans in Washington DC to initiate the Educate Lanka Foundation to address the issue of equal access to education in Sri Lanka, targeting mainly (but not limited to) the diaspora members living around the world for resources. While Sri Lanka's free education system boasts a high adult literacy rate and a primary school enrollment rate, most students from underprivileged backgrounds are at risk of dropping out of formal education, especially beyond grade 9, mainly due to socio-economic hardships. Among those who don't get an opportunity to fulfill their dream education are thousands of promising students with the potential to be Sri Lanka's future leaders. The predicament of Sri Lanka's "free-education" system was well described recently by a disgruntled student himself: "The sad reality is that people are paying for education. I paid. Everyone pays." Driven by the understanding that education is a fundamental human right, our purpose through Educate Lanka is to provide that right and opportunity to students who would otherwise not be able to afford the level of education they deserve. 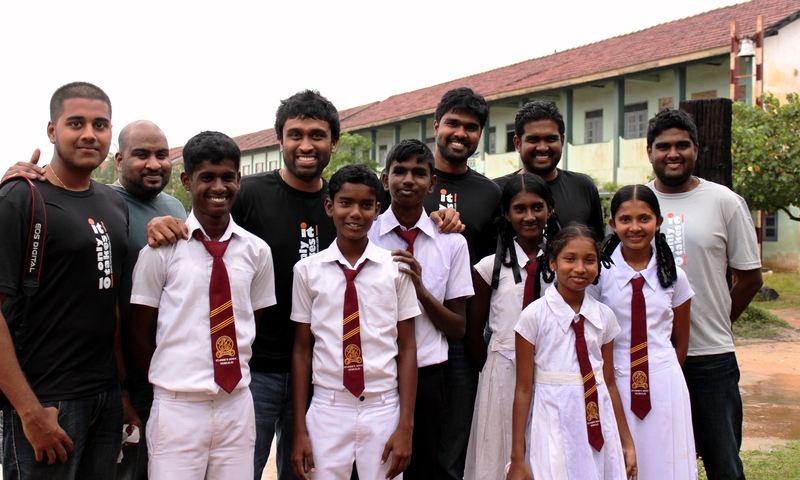 As an online model that crowd-funds the cost of education of promising students from underprivileged backgrounds, Educate Lanka provides diaspora an opportunity to give-back to their home country through micro-philanthropic investments and other non-financial means including volunteerism and sharing of knowledge and expertise. What started as a volunteer project, Educate Lanka has now grown to a full-scale 501(c)(3) non-profit. Given its impact in Sri Lanka and immense potential globally, I decided to fully commit to Educate Lanka last year. With a valuable seed grant from the MasterCard Foundation, we are now expanding our presence from Washington DC, which hosts only a microcosm of the Sri Lankan expats, to other Sri Lankan diaspora strongholds across the world, while committing to scale our direct impact to 5,000 students and over 10,000 funded School Years by 2017. By leveraging the abundance of diaspora volunteer resources for operations, we have enabled an attractive peer-to-peer platform for individual philanthropists to invest in the future of deserving students through $10-$25 monthly scholarships, through which 100 percent of their funds reach the students. By committing to fund through the completion of their higher education, and by providing on the ground mentoring through our own community leaders, we ensure that students are given access to and are able to gain a quality education. Investing in the education of nearly 400 future leaders through over 1,000 individual philanthropists (including non-Sri Lankans) across the world since 2007, we have come to realize that Educate Lanka is more than just a crowd-funding philanthropic platform that finances scholarships. With the addition of students from the North and East of Sri Lanka, areas that were severely affected by the war of nearly three decades, we have started seeing something unique: a strong demand of interest by diaspora to invest in students from outside of their own ethnicities and religions. We have inadvertently built a platform that offers the diaspora who have been away from their countries of origin an opportunity to reach out to other ethnicities and religions, showing promise of reconciliation, tolerance, and deeper understanding among inter-ethnic and inter-religious communities. In our current portfolio of students, we can find many examples of diaspora from Sinhala, Tamil, or Muslim backgrounds investing in students outside of their own ethnicities and religions. With debates, discussions, and tension still continuing about ethnic and religious coexistence and harmony in Sri Lanka, we strongly believe Educate Lanka has even a bigger role to play in the future with both the diaspora and students themselves, given our reach and presence on both sides of the spectrum -- in and outside of Sri Lanka. Over the past few years, our efforts and role with the diaspora have been recognized by leading international organizations and actors. As a member of the IdEA, I discussed about Educate Lanka's efforts with the diaspora at its inaugural panel on education in 2011. In 2012, the Volunteers for Economic Growth Alliance (VEGA) recognized our volunteer efforts by awarding the Global Diaspora Volunteer Award, while I spoke about our role in promoting US-Sri Lankan diplomacy at the US State Department. During the same year, I was selected as a finalist for UN Volunteer of the Year Award. Although the diaspora's engagement with their countries of origin is not something new, their role was often ignored or associated merely with "brain drain," "asylum," or "remittances." Many failed to realize the enormous potential of their resources that could play a crucial role addressing critical issues and nation building efforts in their countries of origin, ranging from philanthropy to investments, volunteerism to entrepreneurship, and innovation to diplomacy. Despite the downturn of the global economy, many developing countries continue to see their remittances amounting for double-digit percentages of their GDP. Sooner rather than later, we will see the emergence of more avenues and opportunities that leverage these diaspora resources to address critical issues and spur development. As for Educate Lanka, we are committed to sharing our best practices with other global communities who could benefit from our experience. There is no reason for us to not believe in Educate Lanka becoming Educate World in the future.